For this week’s Medieval Romance Monday we are featuring Castles, Knights, and Chivalry. You can pre-order this great collection of 4 Medieval Romance Novels now for only $0.99 cents on Amazon. If you are in Kindle Unlimited, this great collection will also be available for you. Look for it on August 1, 2015! THE LADY AND THE FALCONER by LAUREL O’DONNELL – He is a MYSTERIOUS FALCONER, intent on reclaiming what is rightfully his. She is the LADY of Castle Fulton, determined to keep her people safe from the siege that threatens them all. Can they overcome betrayal and vengeance to find healing love? LADY OF THE MIST by ELIZABETH ROSE – Garrett is a Baron of the Cinque Ports, loyal to the crown in keeping the channel safe. Echo is the daughter of an infamous pirate, taking a nobleman prisoner. Love and honor clash as two people from opposite ends of life face the most difficult challenge of all. DEMON LAIRD by KATHRYN LOCH – Tortured by the English, Ronan MacGrigor escapes only to face the fear and terror of his own clan. His hope lost, he teeters on the precipice; darkness or redemption. Yet a woman from an enemy nation, a Sassenach healer, refuses to run. Before Lia stands not the Demon Laird, only a young man in desperate need of healing. They say he made a deal with the devil . . . now the devil demands his due. AT HIS COMMAND by RUTH KAUFMAN – What’s a lady to do when the king commands her to marry a lord, but she’s falling for the knight sent to protect her from undesirable suitors and is a scribe for the king’s rival for the throne? LAUREL O’DONNELL is a best selling, award-winning author who finds time every day to bring her characters to life. ELIZABETH ROSE is a best selling author of over 40 books, writing medieval, paranormal, contemporary and western romance. KATHRYN LOCH, the author of multiple best selling novels such as Mist Warrior and Shadowed Hawk, is honored to join forces with esteemed authors Laurel O’Donnell, Elizabeth Rose, and Ruth Kaufman, with the medieval Scottish Highlander and best selling title to date, the highly acclaimed Demon Laird. RUTH KAUFMAN is the award-winning author of the Wars of the Roses Brides series. Ruth is also an on-camera and voiceover talent, freelance editor and speaker. Get Castles, Knights, and Chivalry on Amazon! 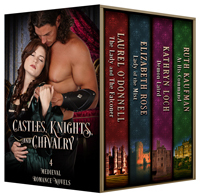 This entry was posted in Medieval Romance Monday and tagged elizabeth rose, kathryn loch, laurel o'donnell, medieval romance boxed sets, medieval romance monday, ruth kaufman. Bookmark the permalink.